The fourth in my series of d100 random encounters tables for terrain type for the Furthest Lands continent, brings us to deserts. Water use, exposure to heat, and to the cold of night are the greatest problems in any desert, but owl wizards, leucrotta, and hierarchies of sandworms will keep those deaths interesting. The largest and most important desert on continent is the Tomada Yoma, the great western expanse, hundreds of miles in any direction, which still has a civilized center in the Great Temple of Tauk Toma. 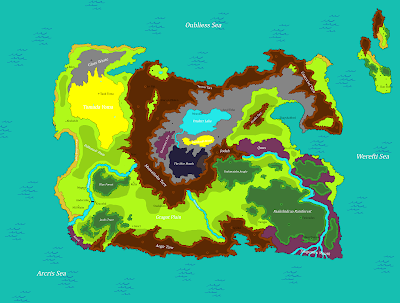 There are also many smaller deserts, scattered across the lands, several in the inhospitable region called "Centerscar", which tend to have dangerous magical/environmental quirks particular to each. 01-02 Great Beaded Lizard – huge, venomous, and implacable, the Giant Gila Monster! 03 Tower Owl – an owl sorcerer-sage that lives in the hollow top of an giant enchanted cactus. Man-sized, but wide and heavy for a bird. The owl can operate the cactus as a golem by serving as its “face”. The cactus regenerates, alters its form and size, throws needles, and manufactures a host of dangerous chemicals to coat them. 06-07 (Greater) Leucrotta – superficially it resembles a large antelope: small fine head, long neck, sleek torso, and long hooved legs. On closer inspection, a wretched monster: mad red and yellow eyes, matted fur, and a mouth that continues all the way down the neck to the torso. The leucrotta's secret maw is filled with row after row of teeth, and the source of the beast's near-magical vocal mimicry, numerous tongues. 10-11 Bombardier Beetle – giant beetle with a caustic chemical weapon. 12-13 Hurry Ants – pony-sized, stilt-legged ants that burst from the sand and dash about, madly killing and dismembering prey before dragging the pieces underground. Their exoskeleton is thermochromic, it cycles from cold black, through blue and purple, to warm red and orange, to hot yellow and white within a few minutes of emerging on the surface (AC goes down throughout cycle). Their bodies explode 20 seconds after turning white hot, showering the area with molten clumps of exoskeletal goo and chemically activated combustible blood. The ants will occasionally force their own explosive deaths, to cover their retreat or counter dangerous opponents, but in general are in a “hurry” to escape the sun. 14-15 Giant Rattlesnake – arguably the most dangerous of all the vocal snakes, rattlesnakes are typified by their great paranoia. Highly intelligent, desperately fearful, and brutally venomous, they are best avoided. 18-19 Ultrachiroptera Flock – the giant bats of the desert night, large enough to bear a man as prey or rider. 70% carnivorous, 30% nectivorous. 20-23 Hyaenadon Pack – multiple species exist in a range of sizes (1d8 x 100 lbs. 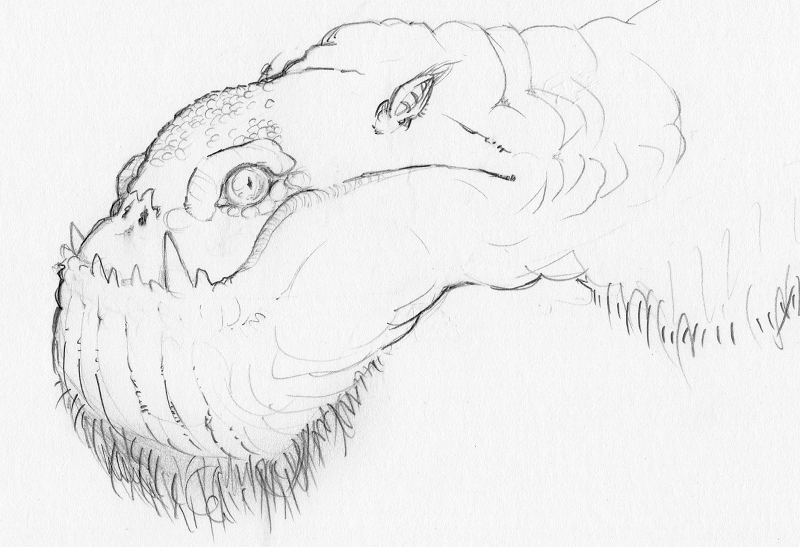 ), replace gorgonopsids as pack hunting predators in the most arid regions. 24-25 Bellows Horse – hollow, wheezing, rapid. Boneless, sightless, restless. Inscrutable, elegant, horrible. A bellows horse is a three-legged, accordion-bodied, beast that seems to make little sense. 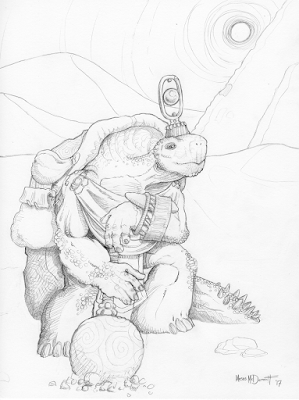 26-27 Giant Tortoise – non-aggressive, with a powerful bite and unfailing stamina, perfect for riding or bearing loads... very slowly. 28-29 Cudgelhead – a huge, two-legged monster with a battering skull. Cudgelheads do not eat the creatures they beat into a paste with their bony faces, their diet is unknown. 36-37 Obelisk – a statuary monster from an ancient civilization, some break into pieces or twist into a mobile shape, some remain in their original form and function like a turret or a roper monster. 38-41 Glyptodon Herd – herbivorous giant mammals with armored shells and bony, clubbed tails. Often domesticated by the umash, they produce milk, make slow but steady pack beasts, and every bit of one's corpse is useful. 42-43 Shard Leech Scree - razor-edged stones used as the shell of a land mollusc, 4"-14". Hide in areas of loose rock waiting for man size or larger prey, throw themselves en masse at a target, pierce flesh and release a mild paralytic venom, drink their fill of blood, fall out of the target, and move away from the remains. 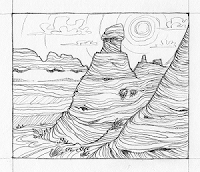 44-45 Thirsty Wind – a day-long weather change, no cloud cover with extremely hot and unnaturally dry winds. Water use is doubled, exhausted npcs and animals may die outright. A thirsty wind always blows against the party's goal. 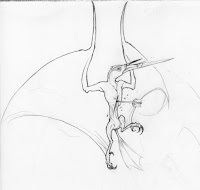 46-47 Lancet Stirge Flock - naked birdlike creatures with elongated, saw-edged lower jaws, cat size. Function as stirges but can pin targets in numbers and interfere with movement/spellcasting. 48-51 Umash Group (1d6) - the baboon-faced race of the Tomada Yoma. 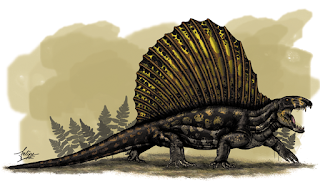 52-53 Solar Dimetrodon – this large species of dimetrodon is capable of storing solar energy in its iridescent sail as it basks, then releasing this energy as a ray or wave shaped attack. Other dimetrodon affected by an energy discharge will be hasted for 1d6 rounds and heal half the attack's damage. 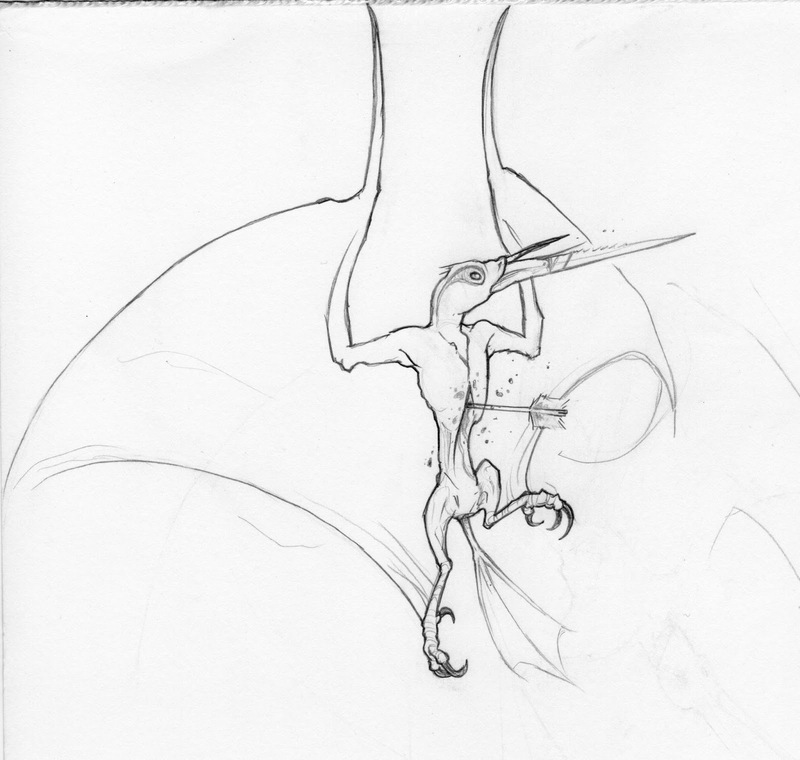 They receive some nourishment through solar energy, but pursue living prey of a certain size whenever possible. 54-55 Manticor - spirit cursed iele, usually lawful/poachers/defilers, now always hungry for other people. 56-57 Sandstorm – a powerful sandstorm batters the area, seek cover or be suffocated, scoured, blinded, even buried. Trails and small landmarks are erased. 60-61 Shem Formation - 4-10 Shem hunting for or returning with captives. Often accompanied by Bloat Cages (1-4), ground slaves (5-50), or aerial slaves (2-20). 62-63 Sandworm – a two to six meter, vibration-sensitive, predatory worm. 64-65 Sandwormother – a slow moving, colossal, swollen sandworm, covered in a thick pink waxy cuticle. The mother worm is constantly laying eggs, even as it moves, even as it sleeps, even after death (for a bit). Eggs hatch quickly, and the speedy arm-length wormlettes hurry back to hide in the mother's mouth. 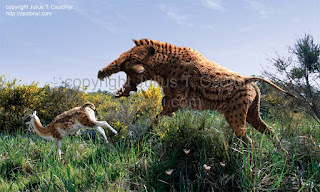 The young are only occasionally disgorged to attack and feed for themselves, if this occurs the mother will avoid attacking the young's targets. 66-67 Sandfather – fifty feet long and covered in armored scutes, the rapid-moving sandfather worm ranges the desert, searching for prey and unfertilized females with its array of eversible head organs. Two of these surprising tentacle shaped appendages are coated in caustic chemicals. 68-69 MutantTroll Pack - slightly undersized trolls that mutate as they regenerate. Each has one additional mutation when encountered and is twice as hungry. During regeneration of massive damage they can fuse together into larger abominations or break into smaller, independent, ruined parts. they will attempt to murder and cannibalize them. 4. Sun Spirit – appears as tricks of light, suggestive afterimages of thin partial humanoids, impossible to see from a distance. Curious and cruel, they will lead the way to dangerous mirages, evaporate exposed water in seconds, and their touch causes heat madness. 72 Dune Dragon – the longer the dragons of the endless sands live, the more time they spend asleep, sand collecting on their serpent bodies. They are often irritable, bleary, confusing fantasy with reality. They control the weather, and their breath is a storm of sands that tears, or a cloud of dust that lulls to sleep. There is always a cavern filled with drinkable water beneath a sleeping dune dragon. 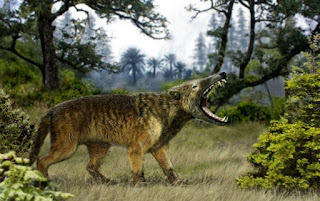 73-74 Archaeotherium (carnivorous boar) – a ravenous omnivorous beast, like a monstrous boar with long legs and a huge head. Simple and single minded with an amazing olfactory sense. 75-76 Giant Antlion (Funneller/Doodlebeast) – the L-G sized predatory larva of an unknown insect. The giant antlion buries its body in loose sand and creates a funnel trap, where it lies in wait for prey. 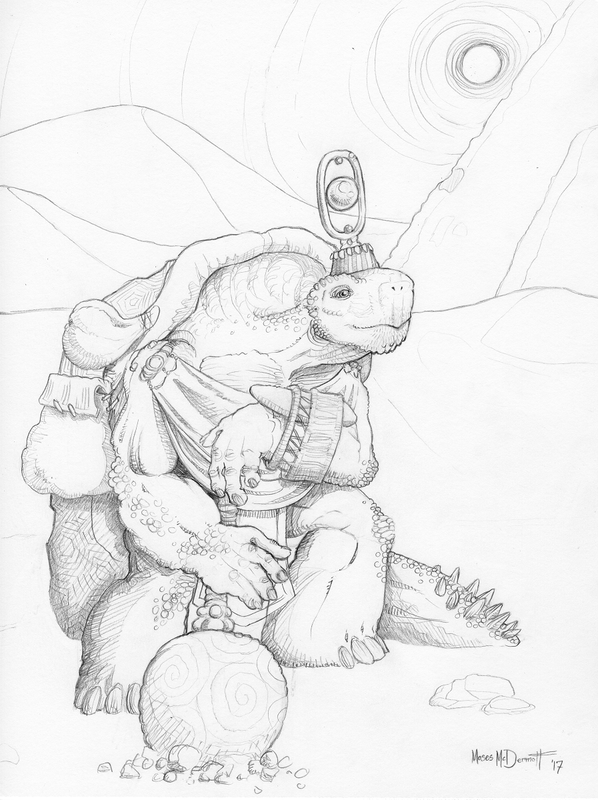 Doodlebeasts have been known to hurl rains of sand, spray caustic acids, and create tremors in the ground. 77-78 Dust Skeleton – the countless dead of the desert, now skeletons made of sand and bone dust. When defeated they reform in 1d100 hours, but can be permanently destroyed with a “mouthful” of water. 1. Yokaibubu Locusts – devouring locusts, large as a man's hand. A plague's worth (plagues may vary). 2. Sweat Flies – quicken exhaustion by drinking sweat and other bodily moisture. 3. Golden Sand Fleas – biting mass of fleas, leave bleeding painful wounds, will infest clothes, packs, and bedding. 4. Black Beads – a carpet of round, shiny, black beetles hungry for non-living organic material: leather, wood, paper, foodstuffs, even hair. Each beetle bears fertilized eggs at birth, and will easily infest belongings if not exterminated. 81-82 Scopophobic Cacti – approach blooded creatures at a rapid pace, as long as nothing watches them. “Strike” by pressing themselves against their targets and draining the water from their blood with wicked needles. 83 Elder'lisk (True Basilisk) - gigantic, slow as stone, fast as a rock slide, the elder'lisk perched atop its heap of broken statues, the evilest eye. A thin tall body, six to ten spindly legs, and two independently moving eyes. Reflecting the creature's gaze will turn just one eye to stone. This basilisk can move silently on its split-toed padded feet, and climbs sheer surfaces with ease. 84-85 Hungry Ghost – ghosts desperate for your water, your food, your breath, your blood. Younger ghosts use their lives' knowledge to deceive and confuse, while the ghosts who have wandered hundreds of years or more are ravening spectres without a trace of personhood left, they will claw what they need from you without hesitation. 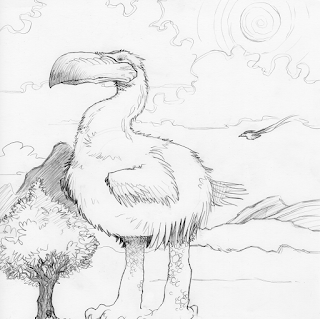 86-87 Giant Vulture Kettle – the party begins to be followed by great vultures who patiently wait for exhaustion or grievous wounds, their presence increases the likelihood of encounters by 20%. 1. Sipping Succulent – a branching succulent whose swollen leaves can be carefully plucked and drunk like little juice boxes up to two weeks later. The liquid is light, refreshing, and mostly flavorless, though it has a slightly medicinal aftertaste. Mildly promote healing when poured on wounds or infected areas. 2. Keg Cactus – a squat, yellow-green, long-needled cactus filled with a great reserve of clear watery liquid within its thick skin. The liquid is mildly alcoholic, but just as hydrating as real water. Living on keg cactus juice only for three days will render a person completely and constantly drunk until they drink something else for three days. 3. Water Melons – delicious watery underground melons 6” to 18” across, keep for a few weeks after picked. If they are opened and the juices stored in other containers, the odor will often attract certain insects and larger animals. 4. Sand Cucumbers (Piss Grubs) – tube shaped underground animals about a foot long. Pinched and stroked in a certain way the creature will squirt out its stored water supply, which can be up to three days worth of water. Cucumbers can be eaten, though they taste pretty awful and will immediately poison their water stores when injured. 5. Voilumpf - sized between camels and giraffes, six long thin legs, a long neck with a small, nearly eyeless head, feathered antennae, and a complicated folding proboscis, and an inflatable sack of rubbery skin on its back. These docile, dull-witted creatures eat moisture-rich plants and fungi deep underground and store the excess water in their back sack. Rangers know the animals will violently resist attack, but a person can “tap” their sack for its water and they will take little notice. Sack water is identical to normal well water, just very slightly... pork flavored. Can be ridden, but their food is unsustainable outside the desert. Their liver is the only worthwhile meat on their body. 6. Spider Cups – a white, grape-sized spider will spin a cup shaped web with a cover within a hole in the sand. The webbing is water repellent and the spider uses the water filled cup as a lure for prey. A person can scoop spider cups out of the sand to take away easily, but they are fragile. The spiders are not dangerous. 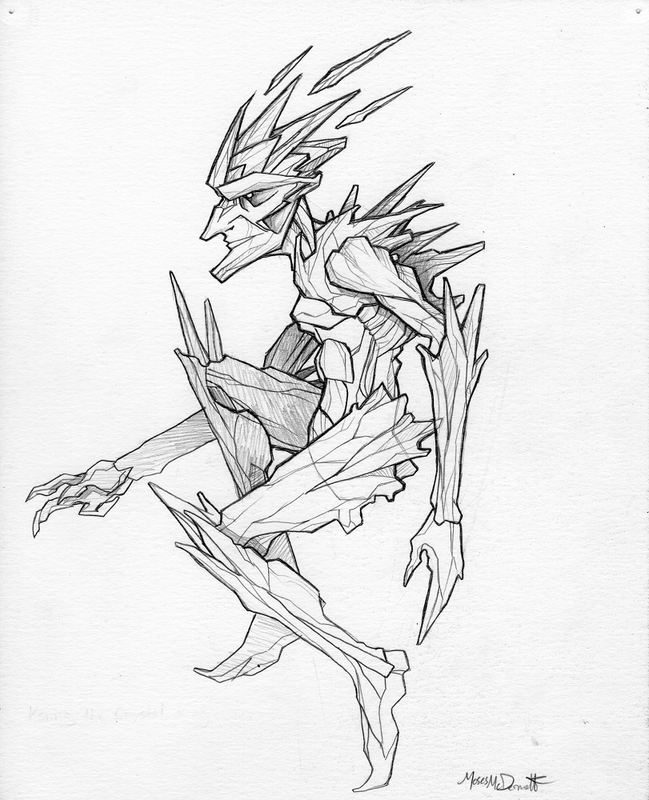 90-91 Dune Ghuul – cannibalistic degenerates of various original races that roam the open desert at night, their life or undeath status up for debate. Their touch is paralytic (of course) and their anguished howls terrify the weak. 92-93 Swimming Sword – a blade-like cousin of the bulette, long and rigid-bodied, can potentially be tamed and used as a mount. 30% chance of being encountered with its immature form, the Severfish. The young specifically attempt with their bladed bodies to amputate digits and limbs for their own consumption. 94-95 Dromiceioseismos Herd - huge (50') flightless birds, non-hostile but dangerous if harassed. Sometimes attract the largest of predators to an area. 1. Mandala Sands – sand that changes color when shifted. Tracks are usually easy to spot and follow, though the vistas can muddle the mind or sicken the stomach. 2. Sandsea – liquid sand that functions almost like water. Normal water vessels will not function properly, if at all. 3. Sleeping Sand – fabled soporific sand. 4. Magnetic Sand – greenish sand that cakes ferrous metal materials, will quickly encumber a person bearing much of them unless scraped off regularly. 5. 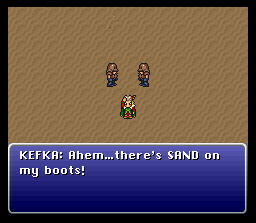 Living Sand – essentially low functioning nanomachines, able to assume one large high-functioning form, or many smaller lower-functioning forms. Some say these are the eroded remains of once mighty ancient golems. 6. Sand Garden – a jungle, orchard, or topiary garden formed of sand. May form only during the day, night, or a particular season, etc. 7. Rust Sand – blueish sand that causes metal equipment to rapidly oxidize. 8. Scouring Sand – razor sharp granules of nearly diamond hard crystal. Shreds skin and light fabric in a few hours, easily blinds unprotected eyes, deals permanent con damage if inhaled. 9. Skeleton Sand – sands composed mostly of skeletal remains, dust skeletons common. 10. Quicksand – horrific cartoonish quicksand, indistinguishable from the normal sands around it. 98-99 Gunmen – radial bodied sand dwelling creatures with a primitive intelligence. They are aggressive, territorial, known to eat anything and anyone, and steal whatever supplies are available (a few have been known to trade). Gunmen or Stars, have a puck shaped body about 2' in diameter ringed with 3-5 rubbery arms each tipped with 3-5 retractable fingers. One flat side of the creature's body is its “face”, disconcerting to most races as it is composed of recognizable features scattered randomly across the surface: an eye here, a nostril here, a mouth? an ear? Each is different from another, but all have at least one eye and a single mouth, which serves both ends of the beast's digestive system. Gunmen create weapons and clothing for themselves, shoddily constructed and made for a strange physiology they are nearly useless to other races.